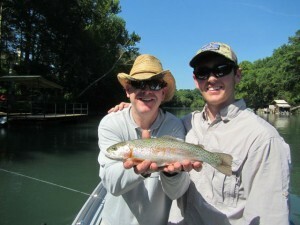 Brian and his son, Rory, are from Nashville, Tn, and both are excellent fly casters and definitely streamer junkies. 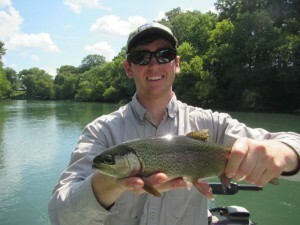 They wanted to try their skills on the Little Red River and hunt for a big Brown Trout. It was not ideal streamer weather with blue bird skies and temperatures that reached ninety-nine degrees! Regardless, we set out on the lower river and with a nice cool fog on the river it did not take long to get hooked up to some decent Rainbows on a Chuck’s Chunk streamer. Both anglers got good chases from big Browns but the fish would just not fully commit. By 11:30AM the fog lifted and the streamer bite really fell off. We went to nymphs and a #14 PBS netted several more Rainbows. At that point it was time to decide to stay on the low river and fish nymphs, or pull out and go to the upper river where generation had begun and try more streamers on high water. For these guys it was an easy call, big water, big streamers. After a river lunch in the shade the streamers were quickly in the water and both anglers quickly had big Brown Trout again chase streamers all the way to the boat. Unfortunately the bright sun and high afternoon temperatures completely turned the fish off and it was a long, hot and tough afternoon. Nevertheless, real streamer jukes are never discouraged and both guys worked hard all afternoon. Next month this duo is off to Ireland to chase Pike and play a bit of golf. Hopefully they will send us a photo of a big Pike with a big ole streamer hung in his jaw!